Rated 4 out of 5 by pennmom36 from Stormy Love Triangle? Professor Mann has asked you to deliver a very important artifact and help him capture the Storm of the Century. This storm is deadly, and if this environmental phenomena isn't contained, the entire world will be at stake. Unfortunately, the first Storm Catcher model isn't strong enough to hold this storm with a mind of it's own, but the professor's assistant Rob is working on a newer and stronger model, and not a moment too soon. You quickly discover that there's a connection between this storm and an Ancient Temple nearby, is this storm the result of a twisted love triangle? The graphics are confusing to me, some buildings are very detailed, others blurry, the characters are spot on but everything else is large and cartoonish, some items don't make sense such as the two boulders (shown in two different scenes) with faces. The storyline is interesting enough, but judging by the demo, there's nothing new here, another malevolent spirit bent on revenge. The only prop you get is a smartphone, which in my opinion makes a game more realistic, which will be used as a journal to store clues found, a camera to take important pictures, a flashlight, and of course you will be able to make and receive phone calls. Many of the inventory items are complex which require some type of interaction before they can be used, in the Collector's Edition there are 14 Achievements to earn and every scene has a Collectible Hunt symbol to search for, complete with an Icon to keep track of which scenes still have a Collectible to find. 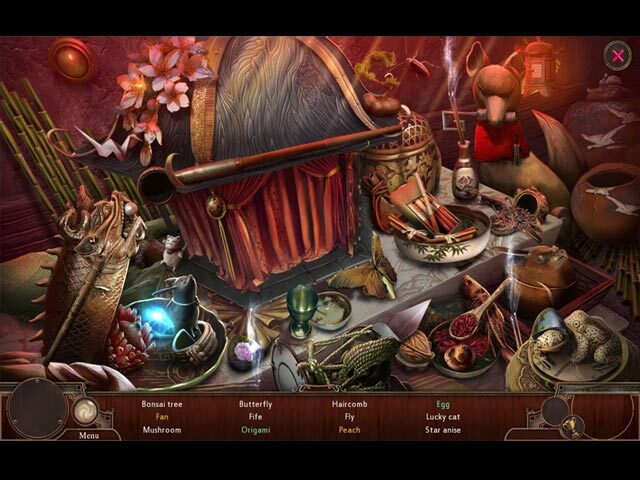 The Hidden Object Scenes also seem cartoonish, with large bulky items to search for within Interactive List Finds, finding Multiples of several silhouetted shape items, or finding items that match their identical pictures as shown on the inventory bar which releases the final item by carving a tree with each item found. 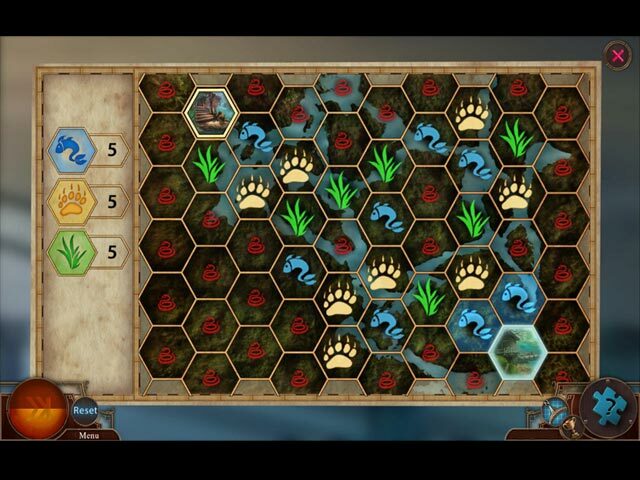 In the CE, each Hidden Object Puzzle has a Morphing Object, and there is an Icon for this feature as well. The Mini Games are far and few between, and are very easy puzzles to solve, but that's okay in my opinion as long as they are somewhat entertaining. The following are brief descriptions of the games you will encounter during the demo: 1) Type in the correct password to access the computer, then arrange folders by swapping them to their correct places turning all folders green. 2) Lead the power from the source to the target by rotating tiles to connect the wires. 3) Clear all chalk blots from the board by dragging an uninterrupted line of two or more blots of the same color using cardinal directions. The Collector's Edition has 44 Collectible Hunt symbols, 14 Achievements, 17 replayable Hidden Object Puzzles, 17 Morphing Objects within the HOP's, 16 Concept Art pictures, 20 Wallpapers, 9 Music Soundtracks, a built in Strategy Guide and a Bonus Chapter, enjoy! Rated 4 out of 5 by the3rdparty from Exciting Storm! I liked this game - although I have only played the CE and SE demos I had fun both times and may buy the SE when I am looking for something to do. I am particularly susceptible to stormy weather and find few things more invigorating in real life. (scary dangerous too). I thought the developers did a great job of demonstrating with both audio and visual, a really exciting storm. Rated 3 out of 5 by FlyBaby777 from Started off great! I was quickly drawn in to the story. Awesome graphics, music and plot. I thought it was going to be a great mystery. I laughed out loud at the plot twist right before the demo ran out and I quickly purchased it. After that, it quickly devolved into monsters, spirits, and magic. There are so many directions to take a story besides the supernatural. Why do all of the developers go there? 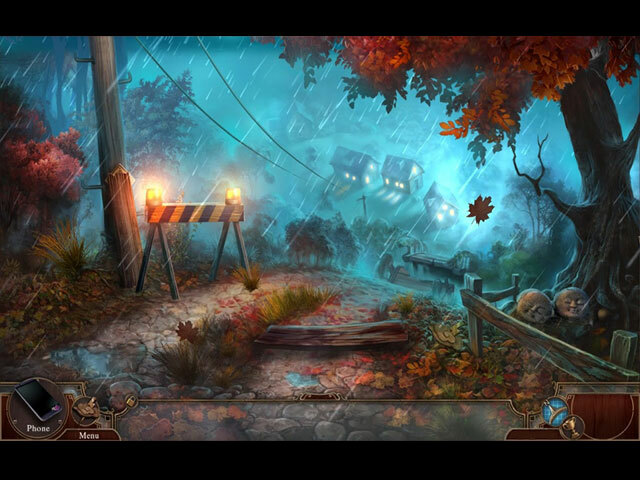 The puzzles and hidden objects were fun and struck just the right balance between easy and hard... but I really lost interest when the story line changed to spirits, monsters and magic. There are a lot of us out here who really don't enjoy the dark story lines. One other point: This game hung up a lot for me. Many times I had to just wait in the middle of a puzzle until I could play again. I'm running Windows 7, so that could be part of the problem. I haven't had any other games do this so far. This one had so much potential. I was very disappointed after I purchased the game and the story line went downhill. If you like that sort of thing, you will probably love this game. The three star rating is mostly for the story line and the freezing during game play. Rated 3 out of 5 by PATinPNS from Storm Chased Me Right Out of the Game This is posted after playing the demo. I own a couple games in this series and enjoyed them tremendously. This one, however, left me wanting. There were many positives, but the over all game was not what I expected. It just wasn't fun. I don't know if it is the fact I'm getting tired of the supernatural aspects of all the games that have been coming out lately or what, but it just wasn't fun. Graphics were okay. They were clear and the colors were acceptable. Sound was very good including the voice overs which were excellent. Music was right along with the action of the scenes and wasn't annoying at all. Hidden objects were varied, what there was in the demo and the mini games were somewhat different than what we usually see. There are several degrees of difficulty including custom which has become my favorite setting. For some reason I did not get a tutorial with this game. Don't know that I really needed it, but I do like to use them in case there is something new and different. The cut scenes were in a different format than normal. A small screen appears and the characters appear in it. I hate to admit it, but I had a bit of trouble figuring out how to get rid of them. There is no "X" to click. All I had to do was click outside of the box and it went away. Yes, I feel stupid. There is an interactive map which does show places to do something. I like that. The story is nothing new. There's a spirit that needs taming and you get to try and do it. I have to assume by the end of the game you do, but there wasn't enough in the demo to give a good example of the story line. I can recommend this game unless you are like me and tired of the spirit world that has taken over the developers. It is not a buy for me for that very reason. Rated 3 out of 5 by bessiegirl from good to bad I demoed this and it looked really good, although the demo seemed to quit early and I thought this might not be a good sign, but I got it on BOGO. The color, animations, graphics were all excellent...voice overs acceptable and I turned the music down. Story seemed unique and the gameplay was OK, but seemed a bit choppy and scenes changed a bit slow which made the gameplay lag. Storyline was different but after purchasing the game it went from interesting to just plain dorky. The effort that went into the HOS to make them unique backfired and they were slow and tedious as were the puzzles. I skipped most of those. I had purchased several games in this series so I was hoping this would be worth it...it wasn't. Custom setting allows for hint/skip to refresh quickly...a total blessing. The game got pretty idiotic toward the end and I was glad when it ended. Not the longest game in the world and I would have been a little upset if I had paid full price for this. Rated 3 out of 5 by mojojam from dejavu I remember playing this demo a couple months ago!!! Not all that bad, but I had 30 minutes of time left when the game demo ended. Not a lot of challenge since I played it before. How does that happen?? Rated 3 out of 5 by kdblueey from Not a 'RITE OF PASSAGE' game quality I own two prior 'Rite of Passage' games (Rite of Passage: Hide and Seek, and Rite of Passage: The Perfect Show). With these two games, I purchased them soon after the demo. I am an active game player with over 150 games, and adding these two games, I knew would be an asset. 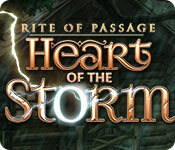 With Rite of Passage: Heart of the Storm, it was nothing more than a drizzle. The graphics were crisp and clear, and the music was OK. The opening scene was probably the best part of the demo, IMHO. There were some scenes that might get your heart rate up a little, such as when you have to quickly put out a fire, so the game is not entirely dull, IMHO. I also thought the professor's facial expressions rather odd, and not quite believable. I did enjoy the HOS, as they offered up a mixed bag. All in all, as everyone recommends in their reviews, try the demo first before you buy. Buyer beware!! Rated 2 out of 5 by biscuitsmama from THE ELECTRICAL STORM IS MORE EXCITING THAN THIS GAME A storm is raging when you receive an urgent request from your friend Professor Mann asking you to bring him an ancient relic as soon as possible. Of course while you are flying to meet him your plane is damaged by the ferocious storm and possibly something else. After you arrive at your destination the situation goes from bad to worse as you find yourself now the most likely next victim of this weather phenomenon. The graphics are good and true to other games in the Rite of Passage series. The voice overs are excellent as are the stormy ambient effects in the game. The game offers a custom mode of gameplay so you can fiddle with settings and tailor the game to the way you like to play. Your trusty cellphone is your most valuable tool in the game. At least in the demo I didn’t see any special tools or gimmicks but I didn’t want to continue the game so who knows what lies ahead. The interactive HOPS are varied and interactive but even they seemed boring. Puzzles are super easy and there was nothing electrifying present. Although the puzzles seem easy at first and didn’t improve as I played further into the game. The games from this developer and the Rite of Passage series are generally excellent so I am not sure what happened with Heart of the Storm. Maybe it is just an off day for me but, quite frankly, I couldn’t get enthused about a game that seemed to lack anything that could ignite even a small spark of interest. Overall, the game was boring and flat. I expect so much more from this development team – one that has brought us some innovative and terrific games in the past so now I am left wondering what happened. Although I purchased the game, I struggled to finish it. I found the entire game not up to par and boring. In the end I was left scratching my head and wondering how a series that started off with such promise ended up wallowing around in the mud. I think it is perhaps time that this series is retired if this is the best storyline the dev can come up with. Even though I didn’t care for the game you might love it. Please try the demo to see if you have a different opinion.